Aria Frequency Lists Are Up! 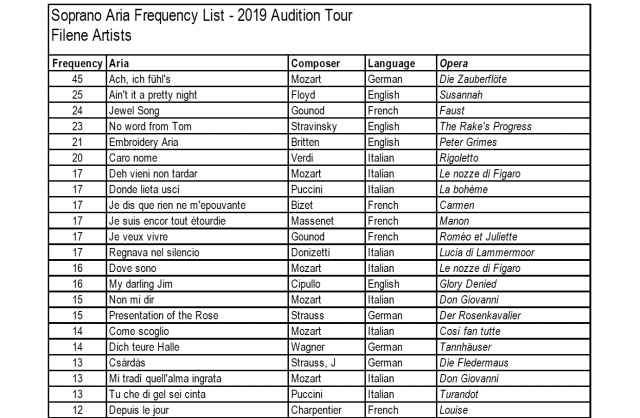 Data nerds, rejoice, the aria lists from this fall’s audition tour are now available on our Audition Resources page. And, as a special bonus this year, the spreadsheet with tabs for all voice types is available as a Google Sheet for download, sorting, and churning here. A little under-the-hood info for those of you who follow and use these lists. They’ve been facilitated in a big way by our proprietary audition application site, which used drop-down lists for aria selections, ensuring that selections were all spelled and represented in the same manner for easy sorting and merging. This year, we moved to YAP Tracker for our audition applications – partially because singers have largely migrated there to track all of their audition season activity, and it makes sense for us to conform. But the big downside is that all of the arias were keyed in by singers, and the parsing of the data took about twice as long. Sorting and merging 4,340 arias is complicated by the multiplicity of ways to refer to an aria (Air de Feu… “Arriere!”… Fire Aria! ), and misspellings of arias, composers, and operas (oh, and hundreds of missing diacriticals…). These lists were a labor of love for me, and they were born from my frustration as a young opera coach, not knowing how to prioritize learning hundreds of arias. And I fully expected to retire them along with myself in a few months :) But so many of you have told us how helpful they are – in the studio, in the classroom, and beyond – that we’re on a mission to perpetuate them. So… starting next year, WTO will be looking for a data nerd to shepherd these lists into the next generation. Sound like a fun grad school project? If you or anyone you know might be interested in helping, drop us a line at opera-at-wolftrap.org! Hello! I may be just the data nerd you’re looking for. Please contact me with information regarding compiling the lists next year, I would be very interested in helping. This is incredible! Thank you for your hard work! Couldn’t resist to play with the data – as a data nerd and opera fan. Check it out at https://public.tableau.com/profile/stefan5887#!/vizhome/WTOAriaFrequencyList2019/WOTAFL2019?publish=yes. Still planning to add a few visuals. As always, these lists are unbelievably helpful for young coaches and pianists. I continue to follow them closely for ideas on which arias to add to my Accessible Accompaniments offerings (playable reductions of notoriously difficult/poorly-reduced arias). This is awesome! I noticed that the Bell Somg and Où va la jeune indoue are listed individually, but they refer to the same aria. Tried to catch all redundancies but inevitably miss one or two… Thanks for letting us know! Will adjust when I have a chance. Thank you for your efforts! Much appreciated from a university professor. It’s nice to see what arias are trending.